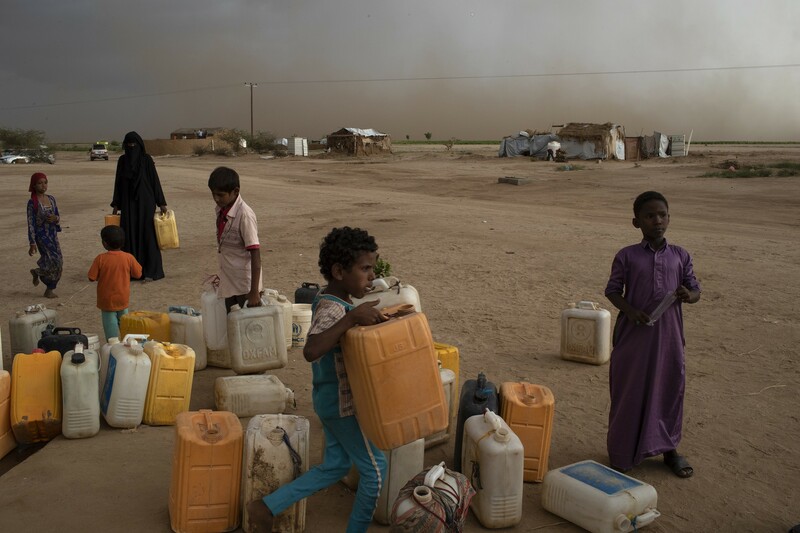 A water collection point in Bani Hassan, Yemen, Oct. 18, 2018. The biggest challenge in 2019 will be the three-year old conflict in Yemen, which has driven millions toward famine and has given the country the status of the world’s worst humanitarian crisis, the United Nations reports. WASHINGTON — The Senate voted resoundingly Thursday to withdraw U.S. military assistance for Saudi Arabia’s war in Yemen, issuing the latest in a series of stinging bipartisan rebukes of President Donald Trump for his defense of the kingdom amid outrage in both parties over Riyadh’s role in the killing of a dissident journalist. The 56-41 vote was a rare move by the Senate to limit presidential war powers and send a potent message of official disapproval for a nearly four-year conflict that has killed thousands of civilians and brought famine to Yemen. Its immediate effect was largely symbolic, after the House this week moved to scuttle it, all but assuring that the measure will expire this year without making it to Trump’s desk. But the action signaled a growing sense of urgency among lawmakers in both parties to punish Saudi Arabia for its role in the killing of Jamal Khashoggi, and to question a decades-old bipartisan tradition of Washington averting its gaze from human rights abuses and other wrongdoing by the kingdom in the interest of preserving a strategically important relationship in the Middle East. Senators also approved, by a voice vote, a resolution to hold Crown Prince Mohammed bin Salman, the heir to the kingdom’s throne, personally responsible for Khashoggi’s killing. The nonbinding measure also calls on Saudi Arabia to “moderate its increasingly erratic foreign policy” and urges an end to U.S. air-to-air refueling of bombers operating in Yemen. The United States stopped refueling Saudi warplanes operating in Yemen last month; the resolution would keep the Pentagon from restarting that support. With the moves, senators were breaking forcefully with Trump, who has maintained steadfast support for Saudi Arabia and Crown Prince Mohammed, even though the CIA has concluded that he directed the assassination of Khashoggi inside its consulate in Istanbul in October.